← This election year, why not vote for what’s right? This entry was posted in Terrible Cartoons. Bookmark the permalink. While we were waiting for post-game fireworks at the Rangers/Tigers game a few weeks ago (in Texas), my husband and I amused ourselves (a little too much, probably) by making it look like giant Pokemon were terrorizing tiny people down on the field. It was awesome. Please keep the posts coming. 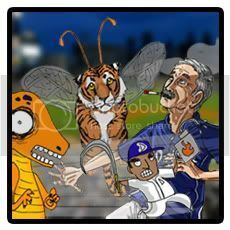 The Tigers need all of the help they can get. I remain hopeful, though it has not been easy this season.